Wabi-sabi is a Japanese aesthetic that literally means taken alone and left alone. There is nothing obscure about wabi-sabi and it is not something only Japanese people can understand. It is often given an incomplete Victorian translation like "simple and quiet" or "rustic imperfection", but these English idioms which are equivalents of the Japanese should be clear to anyone who is as clever as I am. However, widespread appreciation of wabi-sabi is unique to Japan. Let's find out why. Examples of sabi are very easy to recognize in Japan. Walk down a street in Kyoto and you will see many business signs that are worn down, blotted with paint, or even disabled and falling apart as if they had been abandoned 50 years ago. These are not left up to exhibit their sabi: don't give foolish store owners too much credit. However, if it weren't for an acceptance of leaving things alone, the owners would probably feel a strong obligation to keep the signs looking fresh and new. And if you consider them in the right way, the beauty will slowly become evident. Sabi (錆) literally means "rust" but its cognate sabishii (寂しい) means "loneliness". Taking these two meanings together, we see that sabi is loneliness in the sense of being left alone. A teapot left alone accumulates rust. A stone path left alone accumulates moss. A life left alone, as the haiku poets tell us, accumulates sabi. This village in the hills. This would be a wretched place to live. Sometimes sabi is made equivalent to wabi-sabi but you will see that polished things can be wabi-sabi too. The essential intention of wabi is to manifest the Pure Land free from defilements. In this garden path and in this thatched hut, every speck of dust is cleared out. When master and visitor together commune direct from the heart, no ordinary measures of proportion or ceremonial rules are followed. A fire is made, water is boiled, and tea is drunk--that is all! For here we experience the disclosure of Buddha-mind. As you can see, the emphasis here is on the tea and the tea alone. In the medieval period wabi was something that came from taking oneself into a hermitage, and after Rikyuu it came to mean a purposeful imperfection. But the emphasis on an action taken to make something more simplistic remained the same. 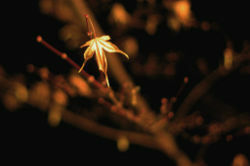 Wabi is often taken out of its wabi-sabi aesthetic in the West and called Zen. We have in the West no appreciation for leaving things alone-- have you ever noticed how new and clean everything is in a hotel, even the so-called "Zen" hotel chain, Westin? It's true that Zen is a tradition that emphasizes sitting alone and the Zen aesthetic merges with wabi in its discarding of luxury and emphasis on simple perfection. But here, long before Japanese people had to make themselves responsive to American conceptions of Zen, we see Sen Rikyuu calling wabi a manifestaton of the Pure Land. So wabi, a sort of simplicity in considering things alone, is a cross-religious aesthetic. Now, these two elements are achieved in an opposite way. Sabi cannot be accomplished through outside interference, but as Rikyuu clearly says you must sweep the room of all dust to create the wabi that manifests the Pure Land, and poor quality or unpolished elements will not do. But today the elements are usually mentioned next to each other in Japan, like a single word. This is because taking a thing alone and leaving a thing alone have a word in common, "alone". So, wabi-sabi is finding beauty in "alone". It is not exactly finding beauty in a feeling of loneliness. That word calls up images of being uncared for or alienated from society. The "alone" of wabi-sabi can be cultivated or uncultivated, and from a Greek aesthetic perspective someone might call it perfect or imperfect depending on their mood, but the end result is something that is enjoyable in its occurrence alone. Thus, today's tea ceremony uses irregularly shaped cups. This page has been accessed 3,682 times. This page was last modified on 7 March 2009, at 08:10. Content is available under Attribution 2.5 .